I'm often trawling the internet for retablos for sale and I came across the one on the left (excuse the poor quality of image) of San Jose or Saint Joseph. It interested me because it very well could be by the same artist who painted a San Jose retablo that I own (right). Often, the attributes of each saint were replicated by many artists so that there was a continuity of symbolism of the saint, so sometimes what you think is a retablo by Geronimo de Leon or the Beestung Lip painter is a copy of them, or possibly both the artists had drawn from the same source, such as a Spanish Colonial painting or a hand-coloured print. In this case, I feel pretty certain that both these retablo are painted from the same hand or at least from the same production studio. 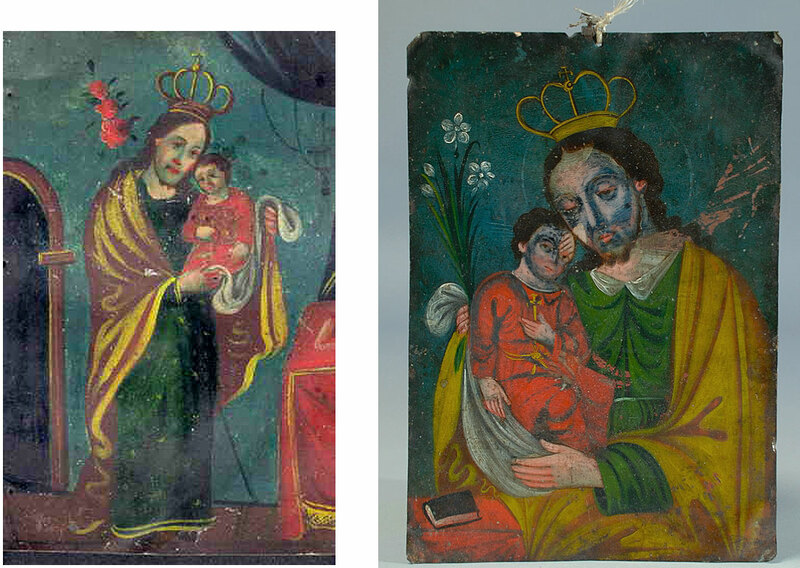 Even though the retablo on the left is more loosely painted, it's a bigger retablo than the one on the left, so usually the artist would have kept his concentration of detail for the smaller scale retablos. Another giveaway is the way the isometric or orthographically formed structures (such as a the table on the left and the bible on the right) are constructed and painted. These objects are like they've been copied from a fish-eye lens image of the form. A strong indicator of the artist's hand is the way the faces were painted, but because of the low resolution of the image on the left and the damage to the paint surface on the retablo on the right, it's too hard to assertain the similarities AND of course the colours - which was the first thing that piqued my interest.